PORT-AU-PRINCE, Haiti, August 29, 2017 /3BL Media/ - Once the country's fourth largest agricultural export, cotton is making its comeback to Haiti after a 30-year absence. Today, global outdoor lifestyle brand Timberland, the Smallholder Farmers Alliance (SFA) and Haiti’s Minister of Commerce and Industry, Pierre Marie Du Mény, announce the reintroduction of cotton as an anchor crop in Haiti which will help revitalize farming, boost the economy and contribute to environmental restoration through a link to tree planting. Last week Timberland, the SFA and Minister Du Mény participated in a ceremonial planting of the first seeds to mark the start of cotton field trials near Gonaives, Haiti. Cotton varieties from Brazil, India, and the U.S. were planted, along with one Haitian cotton strain still grown in local garden plots. Next summer, the SFA will introduce cotton varieties that adapt best to local conditions and organic cultivation, and result in the highest quality cotton for cultivation in volume by smallholder farmers. 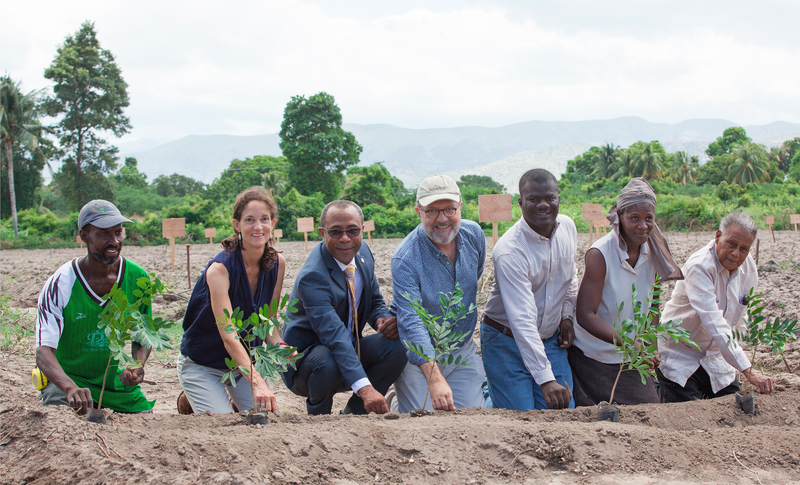 In addition to bringing cotton back to Haiti, this initiative will concurrently plant millions of trees, leveraging an innovative and highly successful agroforestry model developed by Timberland and the SFA over the course of five years. The success of that program – which has planted more than 6.5 million trees to date, and resulted in significant increases in crop yields and income for the farmers – led Timberland and the SFA to conduct a feasibility study, which confirmed the viability of bringing cotton back to Haiti, an optimal location from both agricultural and climatic perspectives. The cotton initiative will be modeled after the original partnership, with smallholder farmers planting trees in return for valuable cotton seeds, agricultural tools and training for their own farms. In addition to helping to fund the five-year initiative, Timberland has committed to purchase up to one-third of its annual global cotton supply from the Haitian smallholder farmers, subject to price, quality and volume. The brand is also working with the SFA to engage other stakeholders in the effort, within the industry as a whole as well as through Timberland’s parent company VF Corporation (sister brand Vans has also committed to support the program financially in its inaugural year). Within five years, some 34,000 farmers (representing 17,000 farms) are projected to be owner-operators of a new network of social businesses that will more than double their current income, plant a minimum of 25 million trees, and connect the farmers to both local and global markets. The new network is also expected to increase the yields of food crops grown for local consumption and provide targeted support to empower women farmers through micro loans, business training and leadership opportunities, as well as provide access to a range of agricultural services typically available only to industrial-scale farmers. In related news, the SFA has forged a partnership with Swiss-based Research Institute of Organic Agriculture (FiBL) to advise the SFA on its field trials and provide ongoing technical and training assistance. A global leader in the field of organic agriculture research, FiBL has extensive expertise in smallholder cotton production. For more information on the reintroduction of cotton to Haiti visit www.smallholderfarmersalliance.org. The Smallholder Farmers Alliance (SFA) applies business solutions to help feed and reforest a renewed Haiti by establishing market-based farmer cooperatives, building agricultural export markets, creating rural farm businesses and contributing to community development. This approach recognizes Haiti as an agrarian nation whose short and long-term recovery is irrevocably linked to the fate of its one million smallholder farm families, each with land holdings of less than 2 hectares (5 acres). Timberland is a global leader in the design, manufacturing and marketing of premium footwear, apparel and accessories for the outdoor lifestyle. Best known for its original yellow boot introduced in 1973, Timberland today outfits consumers from toe-to-head, with versatile collections that reflect the brand’s rich heritage of craftsmanship, function and style. Timberland markets lifestyle products under the Timberland® and Timberland Boot Company® brands, and industrial footwear and workwear under the Timberland PRO® brand. Its products are sold throughout the world in leading department and specialty stores as well as company-owned retail locations and online. Timberland’s dedication to making quality products is matched by an unwavering commitment to environmental and social responsibility – to make things better for its products, the outdoors, and communities around the globe. To learn more about Timberland, a brand of VF Corporation (NYSE: VFC), please visit timberland.com or follow us along the modern trail @timberland. The Swiss-based Research Institute of Organic Agriculture is an independent, non-profit, research institute with the aim of advancing cutting-edge science in the field of organic agriculture. FiBL’s research team works together with farmers to develop innovative and cost-effective solutions to boost agricultural productivity while never losing sight of environmental, health and socio-economic impacts. Alongside practical research, FiBL gives high priority to transferring knowledge into agricultural practice through advisory work, training and conferences.